One of the most memorable moments of the Julie & Julia movie was the scene where Julie and her husband are devouring this mouth watering bruschetta, made with rustic pan fried bread and brightly colored heirloom tomatoes. It literally made my salivary glands go haywire. Now that I think about it, it would’ve been awesome to be an actor on this movie set enjoying all that delicious food. Thankfully, the food stylist, Susan Spungen shared this bruschetta recipe which she developed for the film in an article. I tried it and it tastes exactly how the actors portrayed it in the movie, delicious! At first I made a small batch just to test it out, but I had to make more because I couldn’t get enough. It was that good. So, if you haven’t seen the Julie & Julia, I suggest you make some bruschetta or something just as delectable and watch as you eat, because you will definitely get hungry watching this film. 1. 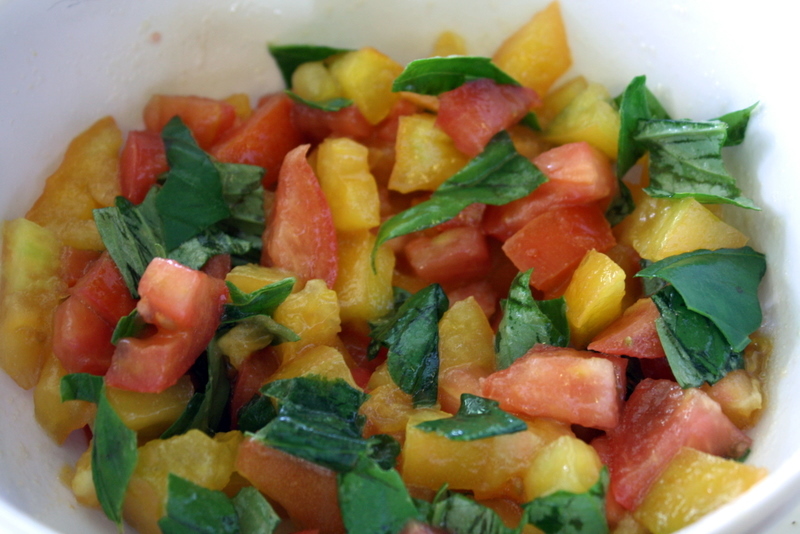 Cut tomatoes into chunks and tear lots of basil leaves into medium-small pieces. In a bowl, toss tomatoes and basil with a good quality olive oil. Marinate for 1 hour at room temperature. 3. Pan fry the bread in olive oil to get it toasted on the outside while retaining some softness in the center. After pan frying, sprinkle with kosher salt and freshly ground pepper. 4. Season tomato mixture with salt and pepper about a half hour before serving. The salt makes the tomatoes release their juices and you don’t want that happening too soon. 5. Top bread with tomato mixture. If the bread is really crunchy, let the tomatoes sit for a few minutes before serving to soften the bread. Note: I used the roasted garlic bread as a shortcut which I highly recommend because that bread is amazing, but if you can’t find it just substitute with any rustic loaf with a stretchy interior with lots of holes and a crisp crust. If you go the regular rustic loaf route, the original recipe tells you to rub a whole garlic clove onto the pan fried sliced bread. That’s the only difference. Ever since I saw this movie, I have been trying to find this recipe……I just looked so delicious! I am going to have to try it out this weekend! Thank you. 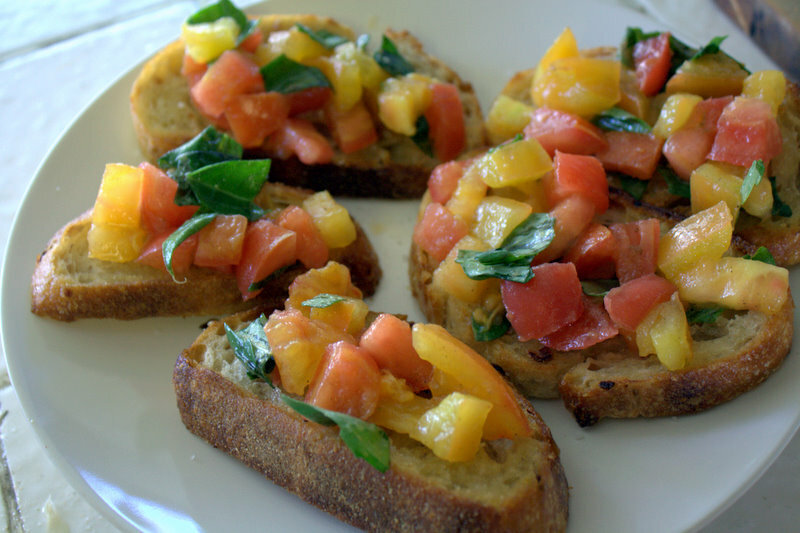 Thank you so much for the Julie and Julia Bruschetta recipe – I watched the movie craving it too. Me and my friend watched the movie and couldnt stop thinking about the Bruschetta recipe, my friend found your recipe and couldnt believe it was the exact one. After spending some time looking around your blog I think it is very interesting and i look forward to reading more. Keeping blogging. My friend and I also watched the movie and like yourself Belinda, we had to find the recipe!!! Needless to say we have no stopped eating this bruschetta since. Keep Blogging – Im loving this site!!! After watching this movie I craaaved this recipe and I’m so pleased that I found it! Though, I do have a question. 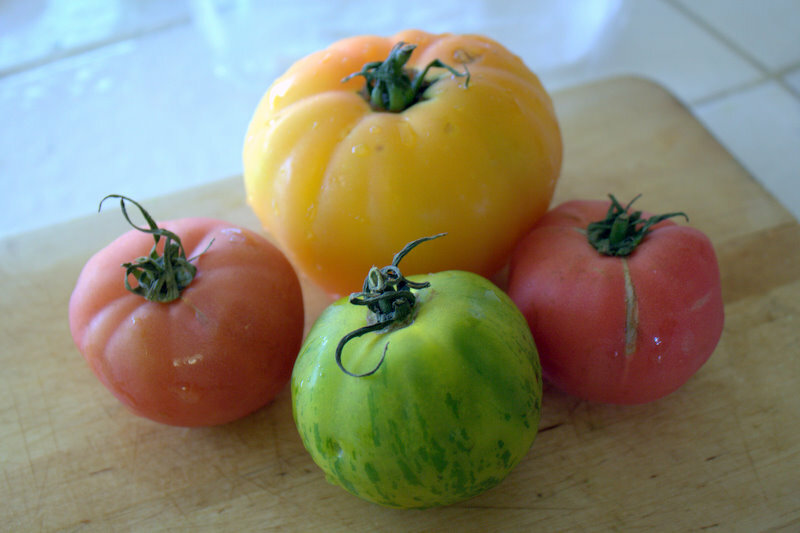 Instead of using the Heirloom* Tomatoes, I used regualr off the vine red, orange, and yellow. (grocery stores lacked my needed supplies) the tomatoes are marinating.. I’m scared it won’t turn out!! Carmen, not to worry! I have also used regular tomatoes in the past with this recipe and it turned out just as good Hope you enjoy your bruschetta! I love this recipe and so did my sister. I have seen the movie several times and my mouth would water at the sight of Julie’s husband crunching down on the bread. Thank you so very much. I is delicious! @carrie, you probably have the heat up too high. I have made this in the past and it was wonderful! however my boyfriend is an old fashion meat and potatoes kind of guy,and tho he liked it, it was not his fav. so tomorrow night i am going to try it with a little motzzarella cheese and bacon bit sprinkeled on top. Wilma, whatever you prefer to seed or not to seed the tomatoes. It doesn’t make any difference just personal preference. I usually seed my tomatoes a little, but not completely. I made this bruschetta for a Jewelry party with friends. It was a wonderful. Will make again and again. I didn’t have heirloom tomatoes, just great garden tomatoes. I recommand everyone try it just once. oil temp, type of tomatoes to use……brilliant! It was amazing!! Keep blogging!! Thank you, thank you, thank you!! I too have looked for this recipe. I am soooo going to try this recipe tomorrow. I made this with tomatoes and yellow peppers sauteed in italian seasoning & olive oil topped with the basil, salt & pepper. It was DELICIOUS!!! 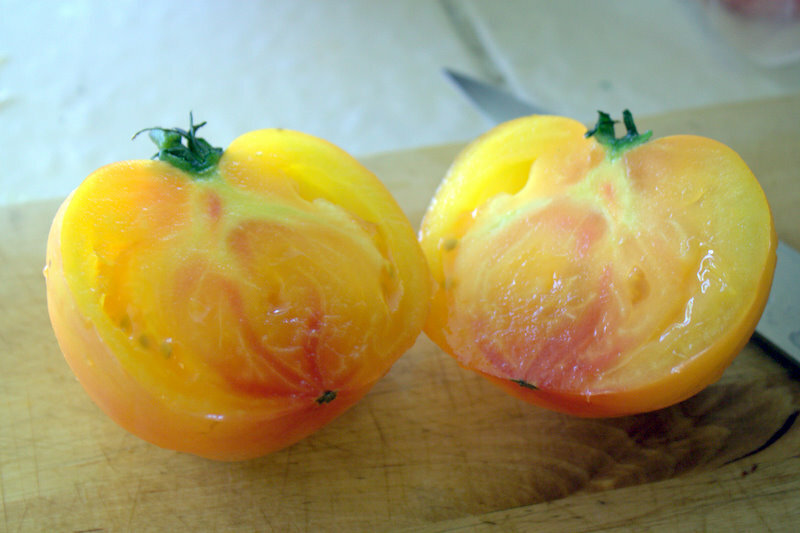 I thought the “yellow” on the bruchetta in the movie was yellow peppers, so I will have to try it with the heirloom tomatoes. Thank you! Hello, we are trying this recipe tonight and we are so excited because we are such fans of the movie. My husband and I are very excited! The only thing is the recipe doesn’t specify how much olive oil to use when tossing the tomatoes… I think I can manage because I make my own recipes and I think I can just make a good estimated guess but for future referrence, if it doesn’t work out tonight, how much do you use? Also how much salt when tossing the tomatoes? Just a few pinches? I saw her squeeze something over it for the juice. I think it was a lemon. Anyone know?